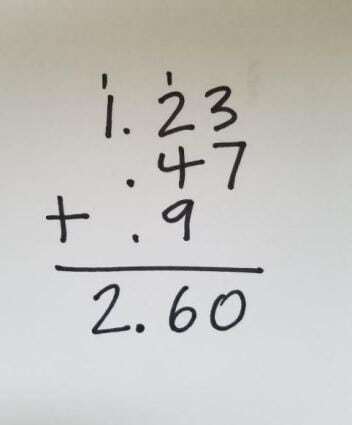 Teaching Adding Decimals: What If You Give the Answer First? I struggle with how to teach topics that revert to learning procedures, too often without understanding. Take adding decimals. This is typically part of grade 5 math instruction. But every time I’ve given students the reminder to line up the decimal points and then add, I’m reminded of the fraction counterpart: Yours is not to question why; just invert and multiply. My ongoing search is for ways to engage students with adding decimals in a way that promotes making sense, reasoning numerically, and solving problems, not merely learning a procedure. I chat from time to time with Nina Sudnick, a teacher at West Elementary in Athens, Ohio, now teaching math to one class of fourth graders and two classes of fifth graders. When Nina and I talk, usually on weekends, we often brainstorm ideas for lessons. Nina is currently working on decimals with her fifth graders. She’s been using ideas from Teaching Arithmetic, Lessons for Decimals and Percents, Grades 5–6, a Math Solutions resource that I wrote with Carrie De Francisco. Nina described to me her recent experience from the book engaging students with The Lobster Problem. This is one of my favorite decimal problem-solving lessons that you can download from the Math Solutions website. But when we’ve given students practice with adding decimals out of contexts, we’ve both found ourselves reverting to reminding students about lining up the decimal points before adding. And we agreed that this seems to put focus more on the procedure than on understanding. Ask: Is 179 a reasonable answer for adding 123 plus 47 plus 9? How could you explain without adding the three numbers? Discuss: I’d have students think first by themselves, then talk in pairs, and then I’d ask some to report to the class. Then, perhaps, I’d have them verify that 179 is, indeed, the correct answer. Ask: Suppose I had written this on the board instead and asked the same question: Is 2.60 a reasonable answer for adding 123 plus 47 plus 9? How would you explain? Discuss: Again, I’d use the Think-Pair-Share routine. Present a problem: Suppose I told you that the second equation used to be correct before someone erased the decimal points that were in the addends. Can you figure out where to insert decimal points so that the sum of the three addends would actually be 2.60? Then I’d explain that I wrote the problem horizontally, intentionally leaving off the decimals points in the addends to make the math puzzle. Select two or three decimal numbers and add them. On an index card, write your name(s) and your horizontal equation. If there’s extra time, make up another problem. I’d give time for them to complete this. And, even though I often feel the pressure of time when teaching, I’d stop myself from “moving on” and devote at least the next class to having students solve each other’s puzzles. Too often, I don’t give students enough time to explore, worrying that it’s too much playing. But Joe Schwartz’s recent blog, Play On, was an important reminder to me not to cave to the tyranny of time and allow students time to experience. If you had to rank a puzzle as Easy, Medium, Hard (1 star, 2 stars, 3 stars), how would you decide?